It wasn’t a surprise to me to find, for two years in a row, that our Study of Product Team Performance identified that onboarding new team members highly correlates to high product team performance. Last year’s study revealed five factors that, when all are missing, is almost a guarantee of low product team performance, but when all are delivered give teams a two-out-of-three likelihood of high level team performance. Onboarding members into product teams was one of those five factors. 75% of responding organizations underestimate the importance of establishing streamlined processes that enable product team members to quickly become contributing members to the product team’s success! Most organizations apply a sink-or-swim approach to bringing new members onto their teams. 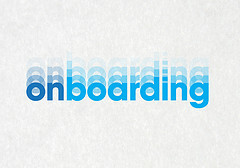 Good team onboarding practices were a lesson I learned early in my programming management career. I inherited Apple’s Finder team just after they’d done a ground-up re-write – and just after most members of the team had departed for some equally ambitious project elsewhere rather than sticking around to enhance and evolve the result. I had a tiny nucleus of a team that I needed to rebuild. And with my first hire, I discovered I had a problem. It’s common to give new programmers a first task to set up their programming environments and sandboxes, install their tools, pull source code, compile, and check their result against the team’s official last build to confirm everything. But when I gave that assignment to my first new hire, our systems turned out to be so convoluted that it took him a week to get everything in place and get the entire Finder built and validated. So the second task I gave him was to measurably shorten that for my next hire. I gave that same second task to every subsequent hire. Three years (and a number of hires) later, downloading the source and tools and creating and validating the build could be accomplished by a green new hire in less than 30 minutes. That’s just one tiny part of making onboarding effective and useful. We cover lots, in our chapter on the topic. Most readers tell us that it’s one of the most valuable chapters in the book – in part, because it’s so seldom addressed – or even considered. While H.R. departments in many companies establish processes that successfully onboard new employees to the organization, that’s simply not enough. It’s important to get them through the benefits part, and to make sure they get a corporate meet-and-greet. But if they aren’t brought onto their team effectively, their team will suffer for a long while after. Managers and teams need to establish a broad set of processes that successfully onboard not only new hires but new contractors and transferring employees onto their teams. As the 2012 Study of Product Team Performance showed, it’s one of five factors that make the difference between team failure and team success. As our 2013 Study of Product Team Performance showed, teams have a lot of room to improve.